Pictures have always been a part of ministry. Throw in digital images AND social media and you have powerful tools to share the gospel. Join WELSTech this week for our continuing series on Social Media in Ministry with a look a two popular photo sharing sites: Flickr and Google Photos. As a bonus, you’ll also hear about upcoming WELS events, Martin’s new “macro” macro lens and help writing God’s Word on your heart. 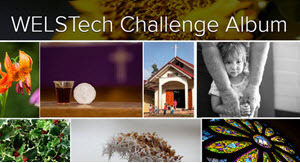 Flickr and Google Photos for ministry – Perhaps not at the top of most social media list, Martin and Sallie explore the use of photo and video hosting sites, Flickr and Google Photos, in the church and school setting. View the Flickr and Google Photos for Ministry infographic. Check out Google Photos Tutorial 2016, a new addition to the WELSTech Product Demo playlist. Episode 489 – Tune in for tech-in-ministry goodness of the people, by the people and for the people … on WELSTech community feedback week! Release date: Wednesday, March 22.